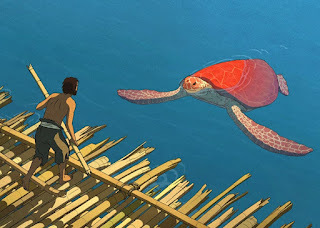 Directed and designed by Michael Dudok de Wit and written by de Wit and Pascale Ferran, La Tortue Rouge (The Red Turtle) is the story of a man who gets shipwrecked onto a desert island and finds a companion in a gigantic red turtle. The film is an animated feature with no dialogue as it play into the emphasis on storytelling through images and music. La Tortue Rouge is a gorgeous and evocative film from Michael Dudok de Wit. The film is a simple story of a man who is washed ashore on a deserted island as he tries to leave only to end up being stranded where he encounters a gigantic red turtle who would change his life. It’s a film with a simple story as it plays into a man dealing with being stuck on an island as he tries to leave the island while trying to get to know his surroundings. Especially as the island is filled with an oasis, bamboo trees, tiny crabs, and all sorts of things as his encounter with this red turtle would mark a major change for this man. The film’s screenplay by Michael Dudok de Wit and Pascale Ferran from de Wit’s story contains no dialogue other than a few screams as it is more about this man on an island trying to survive as he would eventually something more in the course of the film. The direction of de Wit is definitely beautiful in the way he presents the look of the sea, the island, and the creature. Also serving as the film’s production designer and animation director, de Wit would go into every detail of how everything would look including some of the stranger moments in the film. While there are voice actors who would do some of the screams for the characters in the film, there is never a word of dialogue heard other than “hey”. The direction would have de Wit use a lot of wide and medium shots for much of the imagery he would create throughout the film as a lot of it is hand-drawn animation which does have something that is quite rich in the detailing of how everything look including the bamboo forest and the design of the sea turtles. A sequence involving a tsunami is very intense in how de Wit would build up this event very slowly and have it unfold to play into life on a deserted island. Still, de Wit would show how a man would overcome that and maintain a life in this island. Overall, de Wit creates an enchanting and rapturous film about a man stranded on a deserted island with a red sea turtle. Editor Celine Kelepikis does excellent work with the editing in emphasizing on some straightforward cuts to play into some of the drama and dream-like moments. Visual effects supervisor Mouloud Oussid does nice work with visual effects as it play into a few sequences to make it dream-like. Sound editor Sebastian Marquilly does brilliant work with the sound as it play into the sound of the oceans and parts of the island as well as the natural sounds of the creatures on the sea and the island. The film’s music by Laurent Perez de Mar is amazing as it is this somber score filled with orchestral textures in the strings and woodwinds to play into the drama. La Tortue Rouge is a phenomenal film from Michael Dudok de Wit. It is a very simple yet entrancing animated film that manages to provide so much with very little in a film that is beautiful but also has a very engaging story. In the end, La Tortue Rouge is a sensational film from Michael Dudok de Wit.